Professor Carlo Rubbia addressed a City audience on the important part played by elementary particle accelerators. 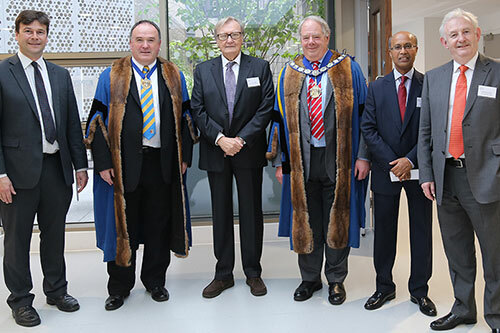 Professor Carlo Rubbia, joint winner of the 1984 Nobel Prize in Physics, delivered the 43rd Edwards Lecture at City, University of London, on May 3rd 2017. The Edwards Lecture is the longest running lecture series at City. It commemorates the work of F D Edwards, a member of staff at City's predecessor institution, The Northampton Institute, and Past Master of the Worshipful Company of Scientific Instrument Makers. Professor Rubbia’s fascinating lecture, “The Role of Elementary Particle Accelerators", explored the role and evolution of accelerators – which bring a small fraction of ionized matter at very high speeds (often at the speed of light) with the help of accelerating radio frequency (RF) electrical and magnetic fields. Such particle accelerators are useful for both fundamental and applied physics, and in technical and industrial fields which are unrelated to fundamental research. There are more than five thousand accelerators of all sizes in various parts of the world, including the 27km Large Hadron Collider (LHC) at CERN in Switzerland, for elementary particle physics. “An accelerator can shrink a tumor, produce cleaner energy, spot suspicious cargo, make a better radial tyre, clean dirty drinking water, map a protein, study a nuclear explosion, design a new drug, make a heat resistant automotive cable, diagnose a disease, reduce nuclear waste, detect an art forgery, implant ions in a semiconductor, prospect for oil, date an archaeological find, and discover the secrets of the Universe”. Digital electronics now depend on particle beams for ion implantation, creating a $1.5 billion annual market for ion beam accelerators. All of the products that are processed, treated or inspected by particle beams represent a collective annual value of more than $500 billion. A semiconductor is a substance, usually a solid chemical element or compound, that can conduct electricity under some conditions but not others, making it a good medium for the control of electrical current. Its conductance varies depending on the current or voltage applied to a control electrode, or on the intensity of irradiation by infrared (IR), visible light, ultraviolet (UV), or X rays.